An airstart, sometimes referred to as "air start", is a power source used to provide the initial rotation to start large aircraft jet turbine engines. This unit blows airflow into the turbines engines. The airflow is measured by “PPM’s” pounds per minute. Skybus LLC/ Global GSE stocks a variety of aircraft air starts. If you do not see what you need here, please contact us as we have new stock arriving weekly. 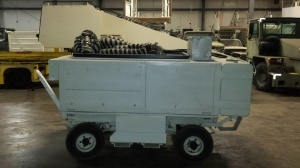 Used Libby A/M32A-60 Ground Power Unit/ Air Start Combo unit consists of a gas turbine engine and an AC/ DC generator. The generator can provide continuous 28-volt DC power at 500 amps and 120-volts AC power at 75KVA. The combined load limitations are 60 KW AC, 500 Amps DC. The air start is capable of 120 psi at 59-degrees Farenheight.